Join the CUNY Internationalist Clubs! We are the CUNY Internationalist Clubs, the organization of revolutionary Marxist students at the City University of New York. We seek to win students to the struggle to sweep away the wreckage of capitalism and to replace it with a socialist society. Capitalism is a system that produces endless war, poverty and racism. Just look at the world around you. Today, with 20 million people jobless in the U.S., with half of all 16-to-24-year-olds unable to find work, with 18 million homes unoccupied as the banks foreclose with a vengeance, with 400,000 immigrants deported every year and the unending U.S. war and occupation of Afghanistan and Iraq, it’s not hard to see that we need a revolution. Our job is to help make it happen. The CUNY Internationalist Clubs go back to the fall of 2001 when we waged a campaign in defense of immigrant students at CUNY. As the U.S. invaded Afghanistan, the CUNY administration, prodded by racist politicians, did its part for the “war effort.” It tried to throw thousands of immigrant students out of school by charging them the much higher “out of state” tuition rate. In response, the Internationalist Group initiated protests of hundreds that eventually were able to roll back this “war purge” for many undocumented students. Students who worked on this campaign went on to form the Hunter Internationalist Club. In 2003 we were joined by the Revolutionary Reconstruction Club at Bronx Community College, and began publishing our newspaper Revolution. 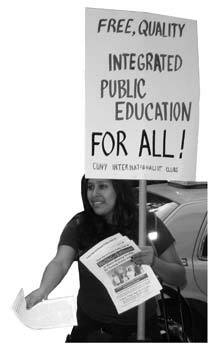 So what do the CUNY Internationalist Clubs do? Well, first of all, we educate ourselves and our fellow students about the struggle of the working class and the oppressed, and the revolutionary theory of Marxism, with forums, study groups, and our newspaper and other publications. Check out what we have to say, and come discuss it with us! We also agitate against all the injustices that are created by the capitalist system: for the defeat of the U.S. in its bloody imperialist war in Afghanistan and Iraq and attacks on immigrants “at home.” We fight against the racist oppression of black people; to abolish the death penalty; to mobilize workers power to defend black and Latino communities against police brutality. We fight for full citizenship rights for all immigrants; for genuine equality for women, including the right to free abortion on demand and for free, 24-hour childcare; for equal rights for gays and lesbians. We fight for free, integrated higher education for all: for open admissions with no tuition and living stipends so working-class students can afford to study. We don’t accept funds (or censorship) from the school administration: we say abolish the Board of Trustees. CUNY should be run by democratically elected committees of students, teachers and workers. And together with the Internationalist Group, we organize students to join the struggle to put an end to these injustices by helping to build a revolutionary workers party, inspired by the Bolshevik party that led the first successful workers revolution in Russia in October of 1917. Here we need to talk some history. In Russia for the first time ever the workers, supported by the poor peasants and soldiers, smashed the old regime, seized power and formed their own government based on workers councils, or “soviets.” The Bolsheviks saw this as the beginning of an international socialist revolution that would bring down capitalist rule, liberate the colonized subjects of imperialism, and open the road to a future communist world free of class oppression. Today we carry on their struggle. The CUNY Internationalist Clubs stand on the tradition and program of Leon Trotsky, the organizer with Lenin of the October Revolution, leader of the Soviet Red Army and founder of the Fourth International. Despite the usurpation of political power by a conservative, nationalist bureaucracy under Stalin, who betrayed the Revolution and its internationalist program, the Trotskyists unconditionally defended the Soviet Union against counterrevolution from within or without. When capitalist rule was restored in the USSR and East Europe in 1989-92 it led to devastation for working people, particularly women. Today we likewise defend the bureaucratically deformed workers states of China, Cuba, North Korea and Vietnam against imperialism and the encroachment of capitalism, while fighting for internationalist workers democracy to oust the Stalinist rulers who are selling out the remaining gains of revolution. Mass poverty side-by-side with obscene wealth defines our world. The clothes you’re wearing were probably made by workers in Haiti or Bangladesh who are literally paid starvation wages, less than $3 a day, while the bosses make billions by exploiting their labor. But it’s more than economics. Capitalism produces all sorts of social oppression. With the Civil Rights movement ending official segregation, and now the election of Barack Obama, it’s claimed that America has gone “beyond race.” Wrong. From the time of slavery and still today, U.S. capitalism has racial oppression written into its DNA. The vast majority of black people in the U.S. are still last-hired and first-fired, live in segregated neighborhoods, and go to under-funded, over-crowded segregated public schools, under a regime of police brutality. Today in the United States, over two million people are in prison. Most are black or Latino, and most are in prison for non-violent drug or property “crimes.” One third of black men in their twenties are in prison, on probation or on parole. Every day, hundreds of immigrant workers are snatched by the police and shipped to private prisons and concentration camps on the way to deportation, while the media and politicians compete with immigrant-bashing campaigns. The racist Arizona law SB 1070 is “racial profiling” that recalls Nazi Germany or apartheid South Africa: anyone who “looks like” an undocumented immigrant can be arrested if they don’t have proper documents on them. Yet black workers are a strategic part of the U.S. economy, and increasingly immigrant workers are as well. So why are they targeted by the forces of repression? Because the rulers need an “enemy within,” to regiment the population for their “war on terror,” and a scapegoat for the economic chaos created by their capitalist system. Regardless of whether there’s a Democrat or a Republican in the White House, they’re the partner parties of American capitalism. They both voted to hand over trillions to the Wall Street bankers for the economic crisis they created; they’re both war parties. Smaller “third parties” are just pressure groups: the Greens are a home for orphaned liberals as the Democrats lurch to the right, while in New York the “Working Families Party” is just a ballot line so people can vote Democratic while holding their nose. What we need is to break with all bourgeois parties and build a revolutionary workers party that fights to overthrow the capitalist system. Once upon a time, capitalism represented economic progress, in its brutal way. It revolutionized production, swept away the barriers of feudalism, and brought into being an international, millions-strong working class. But those days are long gone, capitalism is decaying. Today technological innovations are accompanied by a decline in living standards. In the U.S. today, the prospects for young people are worse than for our parents: fewer will complete college, on top of which we’re saddled with tens of thousands of dollars in student debt, which you can’t get rid of even by declaring bankruptcy. There’s got to be a better way, and there is. Workers have the power to take control of the means of production, get rid of the oppressive capitalist state, and organize the economy for the purpose of meeting human needs, not for the private profit of property owners. This is the only solution to capitalism: workers revolution. How do we get there? In recent years, there’s been a lot of talk by anarchists and others against parties. Yet history shows that for the working class to take power requires a party to centralize and lead the struggle against a very powerful and centralized enemy. The idea that we can prevail against the Pentagon, the White House and Wall Street with little collectives is simply not serious. The revolutionary party we need must be one that champions the cause of all those exploited and oppressed by capitalist society, bringing revolutionary class consciousness to the mass of workers in the course of the class struggle. Students and youth can play an important role in this struggle, if we understand what we’re fighting for and get organized, allied with the power of the working class. That’s what we in the Internationalist Clubs are about. There are some other groups at CUNY that claim to be “socialist.” But they stand for something very different. The International Socialist Organization celebrated the election of Barack Obama, the commander in chief of U.S. imperialist war, and plastered Hunter College with posters saying “yes we can.” The Spartacist League once stood for revolutionary Trotskyism but abandoned the fight to defeat “its own” imperialism in the wake of 9/11. Earlier this year it supported the U.S. military occupation of Haiti. Groups like “Fight Imperialism, Stand Together” and the Party for Socialism and Liberation are cheering squads for union bureaucrats, “Third World” capitalist dictators, and local Democratic politicians. In their various ways, they all end up supporting capitalism. Right now we are a small group with big tasks ahead of us. What we have going for us is a revolutionary program, and a determination to make our deeds match our words. In 2004-05 we were able to kick military recruiters off the campus of Bronx Community College and to spike a planned “Homeland Security” torture school at Borough of Manhattan Community College. We defended Miguel Malo, a Hostos Community College student who was beaten by campus cops for protesting cuts to ESL classes. Recently we came out to defend a planned Islamic center in lower Manhattan against anti-Muslim, anti-immigrant hysteria. We have led student/worker protests at Hunter College against tuition hikes, in defense of cafeteria workers against union-busting, and in solidarity with the first-ever workers strike against a U.S. war, on May 1 2008 when the seaports of the West Coast were shut down by the dockworkers union. We’ve held educational forums for hundreds of students on issues ranging from the war to the fight to free Mumia Abu-Jamal, the renowned radical journalist and former Black Panther on Pennsylvania’s death row for a crime he didn’t commit. We have helped to organize solidarity with courageous strikers at the University of Puerto Rico; and we work closely with our comrades in Mexico of the Comité Internacionalista, which arose from the heroic ten-month occupation of Mexico’s National University.